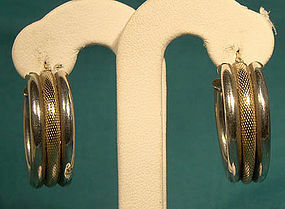 A pair of 1" diameter and 5/16" wide sterling silver and 10k yellow gold hoop pierced earrings. They are stamped AAJ 10K on the ear wire and the pin mount is stamped STG. 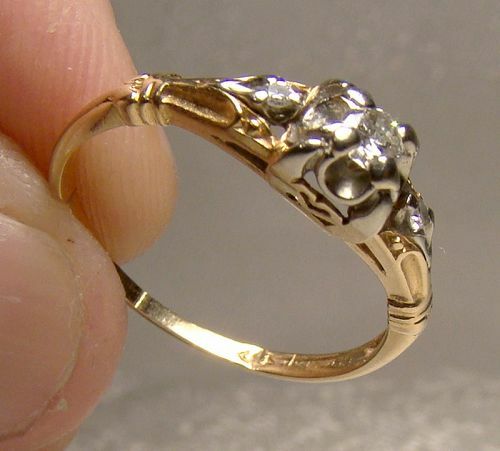 The central gold ring has a textured finish and they weigh 6.3 grams. These earrings are in excellent condition with no dents, bends, corrosion, losses, damage or repairs. All items are thoroughly and conservatively graded and all condition issues are noted; all items are vintage or antique and may have slight signs of gentle use. Surface insured shipping to the U.S. starts at $6.75 (other spots may vary) - insured is higher, and mandatory on items over $95 if paid with a credit card. Items paid with a credit card will be shipped to confirmed addresses only. We do ship internationally. All of our prices are in $US. NOTE: we DO NOT accept PayPal, only VISA and MASTERCARD. 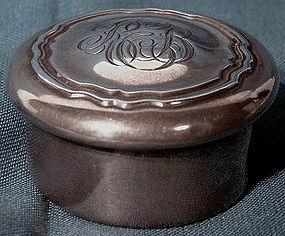 An antique sterling silver 1-5/8" across lidded pillbox or dresser jar c1900-10. This jar is stamped STERLING M150 8 with the Reed and Barton silver mark and it weighs 16.8 grams. it has It has an ornate REB monogram, and the top extrudes slightly, possibly from being made to set in a travel case. The interior is lightly gilded. It is in excellent condition with no dents, bends, corrosion, losses, damage or repairs. All items are thoroughly and conservatively graded and all condition issues are noted; all items are vintage or antique and may have slight signs of gentle use. Tracked packet insured air shipping to the U.S. starts at $13.50 (other spots may vary) - insurance is included. Items paid with a credit card will be shipped to confirmed addresses only. We do ship internationally. All of our prices are in $US. PLEASE NOTE: we DO NOT accept PayPal, only VISA and MASTERCARD. 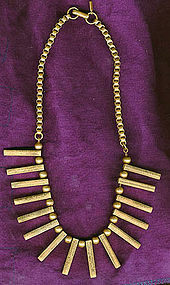 A very early signed vintage Monet Jewelers gold plated Art Deco necklace c1930s-40. 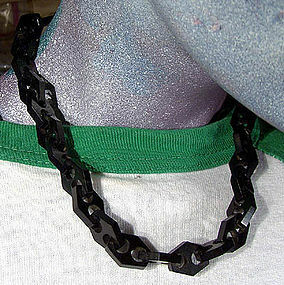 This 16-3/4" necklace has a box link style with a hook and eye closure, along with rectangular tube 1-1/8" drops. It has the original MONET JEWELERS metal tag, and it is in very good condition with no dents, bends, corrosion, damage or repairs other than some losses to the plating on the chain and on the skin-side of the tubular drops. All items are thoroughly and conservatively graded and all condition issues are noted; all items are vintage or antique and may have slight signs of gentle use. Surface insured shipping to the U.S. starts at $6.95 (other spots may vary) - insurance up to $100 is included. Items paid with a credit card will be shipped to confirmed addresses only. We do ship internationally. All of our prices are in $US. PLEASE NOTE: we DO NOT accept PayPal, only VISA and MASTERCARD. 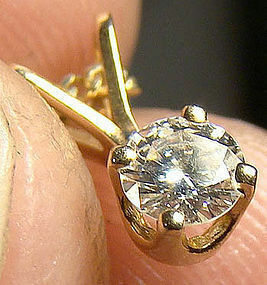 14K DIAMOND PENDANT on CHAIN - Great Gift! A 14k diamond pendant on chain - a great gift. The diamond measures 14 points (calculated), the fine yellow gold chain measures 16", and this necklace weighs 1.8 grams. It is stamped 14K LGC on both pieces, and this item is in excellent condition with no chips, cracks, dents, bends, corrosion, losses, damage or repairs. All items are thoroughly and conservatively graded and all condition issues are noted; all items are vintage or antique and may have slight signs of gentle use. Expedited tracked and insured parcel shipping to the U.S. starts at $21 (other spots may vary, air is higher). Items paid with a credit card will be shipped to confirmed addresses only. We do ship internationally. All of our prices are in $US. PLEASE NOTE: We DO NOT accept PayPal. 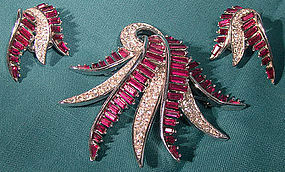 A Marcel Boucher red and white rhinestones trembler brooch and earrings set circa 1950s. This vintage signed jewelry consists of the 2-5/8" x 2-1/4" brooch the matching 1-1/4" x 7/8" clip-on earrings. The pin has a safety catch and the center portion moves freely giving a motion effect. They have the copyright mark BOUCHER 6979 (pin) 6980 PAT. 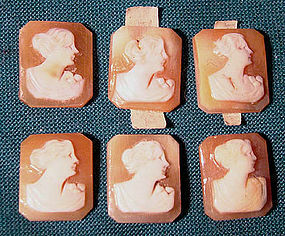 2733491 (earrings). The colour is a true, flashy cerise red colour and this set sparkles wonderfully. This set is in excellent condition with no chips, cracks, dents, bends, corrosion, losses, damage or repairs. All condition issues are noted; all items are vintage or antique and will have signs of use or patination as should be expected. Expedited tracked post to the U.S. starts at $20 (other spots may vary) - tracking and insurance are included in shipping quotes. Items paid with a credit card will be sent to confirmed addresses only. We do ship internationally. All of our prices are in $US. PLEASE NOTE: we DO NOT accept PayPal, only VISA and MASTERCARD. An Edwardian 10k peridot and seed pearls bar or collar pin circa 1900 1910. This antique yellow gold 2" x 3/8" brooch features a natural bezel-set genuine peridot surrounded by genuine seed pearls; it has a safety chain and pin with the original c-clasp. 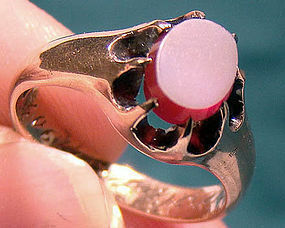 It is not stamped but has been tested for gold quality, and is guaranteed. This item is in excellent condition with no chips, cracks, dents, corrosion, losses, damage or repairs other than a bit of bowing at the ends of the pin. All items are thoroughly and conservatively graded and all condition issues are noted; all items are vintage or antique and may have slight signs of gentle use. Surface tracked shipping to the U.S. starts at $21 (other spots may vary) - insurance/tracking is included in shipping quotes. Items paid with a credit card will be shipped to confirmed addresses only. We do ship internationally. All of our prices are in $US. PLEASE NOTE: We DO NOT accept PayPal, only VISA and MASTERCARD. 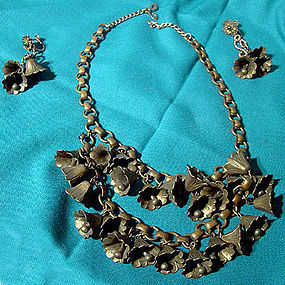 An Art Deco 1930s brass bells necklace and matching earrings set. 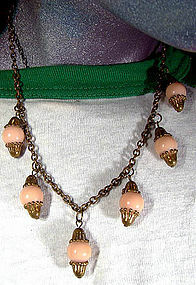 This nifty vintage set consists of the 15-3/4" necklace with a double row of bells and the matching three-bell screw-back earrings with green glass cabochon stones. 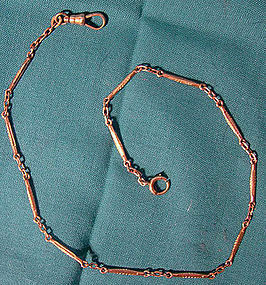 The necklace has a later gold-plated extension on each end with a scissors clasp; these can be removed if desired to restore it to its original choker length. The 2" long earrings dangle freely, and all of bells jingle so people will definitely be able to find you in the dark (Mark wrote this description...). 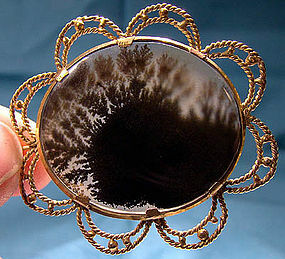 This set is in excellent vintage condition with no cracks, dents, bends, corrosion, losses, damage or repairs other than a bit of flattening to the side of the filigree on one earring. All items are thoroughly and conservatively graded and all condition issues are noted; all items are vintage or antique and may have slight signs of gentle use. Tracked Packet shipping to anywhere in the U.S. is $14.00 - this includes online tracking, air service and insurance up to $70. Items paid with a credit card will be shipped to confirmed addresses only. We do ship internationally. All of our prices are in $US. PLEASE NOTE: We DO NOT accept PayPal. A 14k yellow gold cross pendant with channel set baguette diamonds. 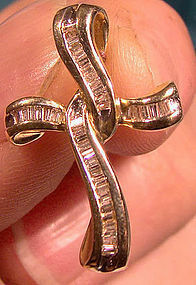 This vintage custom made 1" x 11/16" modern style cross has forty channel-set genuine baguette diamonds. This cross is in 14k yellow gold, it is stamped 14K, and it weighs 2.3 grams. The diamonds total 0.23 carats adn they range from VS2-SI2 clarity and F-G colour. This pendant had an old (2005) appraisal for $1200 and this cross is in excellent condition with no chips, cracks, dents, bends, corrosion, losses, damage or repairs. All items are thoroughly and conservatively graded and all condition issues are noted; all items are vintage or antique and may have slight signs of gentle use. Expedited tracked shipping to the U.S. starts at $31 (other spots may vary) - insurance/tracking included in shipping quotes. Items paid with a credit card will be shipped to confirmed addresses only. We do ship internationally. All of our prices are in $US. PLEASE NOTE: we DO NOT accept PayPal, only VISA and MASTERCARD. 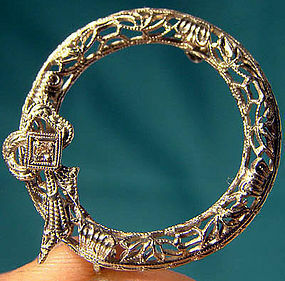 An Art Deco 14k white gold filigree wreath pin brooch with a diamond 1920s. This pin features a 2 pt brilliant cut genuine diamond set in the bow. 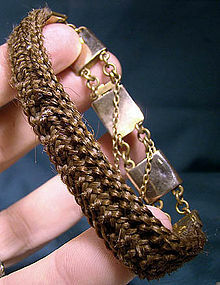 It is stamped 14K with a maker's mark on the safety clasp. It is in excellent condition with no chips, cracks, dents, bends, corrosion, losses, damage or repairs. All items are thoroughly and conservatively graded and all condition issues are noted; all items are vintage or antique and may have slight signs of gentle use. Expedited tracked and insured parcel shipping to the U.S. starts at $23 (other spots may vary, air is higher). Items paid with a credit card will be shipped to confirmed addresses only. We do ship internationally. All of our prices are in $US. PLEASE NOTE: We DO NOT accept PayPal. An Arts and Crafts sterling silver English miniature tyg, fully hallmarked for London 1905-6. 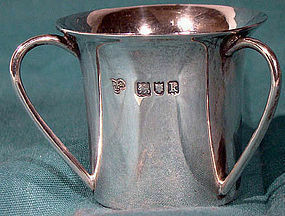 This antique 1-1/2" tall three handle cup weighs 31.0 grams, and it has the maker's mark for the Goldsmith and Silversmith Co. This item is in excellent condition with no dents, bends, corrosion, losses, damage or repairs. All items are thoroughly and conservatively graded and all condition issues are noted; all items are vintage or antique and may have slight signs of gentle use. Expedited insured tracked air shipping to the U.S. starts at $20 (other spots may vary). Items paid with a credit card will be shipped to confirmed addresses only. We do ship internationally. All of our prices are in $US. NOTE: we DO NOT accept PayPal, only VISA and MASTERCARD. © Fiona Kenny and www.fionakennyantiques.com. Unauthorized use and/or duplication of any part of this material without express and written permission from this site’s author and/or shop owner is strictly prohibited.